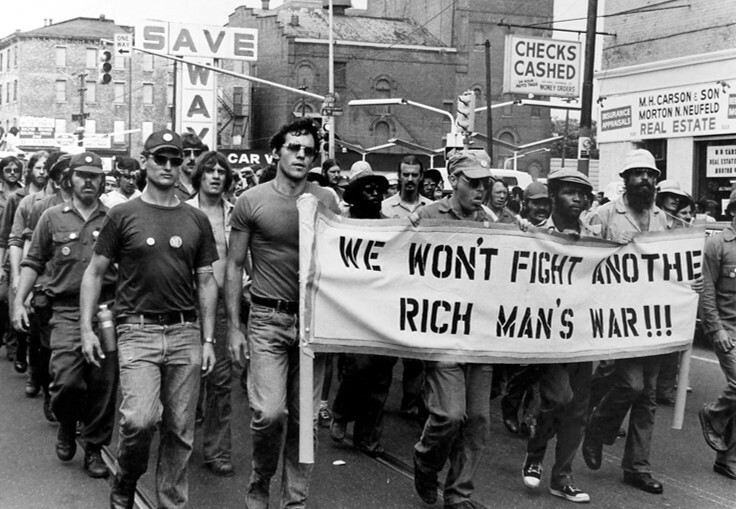 NARMIC worked with Vietnam Veterans Against the War, seen here protesting the war. Diana Roose was a longtime staffer with National Action/Research on the Military-Industrial Complex, or NARMIC, as it was commonly known. NARMIC was a group of power researchers that was affiliated with the American Friends Service Committee. It formed in 1969, at the height of the US war on Vietnam War, and existed throughout the mid-1980s. NARMIC was dedicated to uncovering the defense profiteers behind the US war machine. They worked closely with the peace movement to resist militarism and published valuable reports and slideshows that helped activists better understand the power behind the military-industrial complex – and how to fight it. In October, we profiled NARMIC on Eyes on the Ties as part of our ongoing exploration into the role of power research in social movement history. To get more background on NARMIC, we interviewed Diana Roose about the organization’s history and legacy, as well as her personal experiences and reflections. LittleSis research analyst Derek Seidman conducted the interview over the phone with Diana Roose in August 2017. The transcript has been edited for readability. Can you talk a little bit about your background and how you ended up getting involved with NARMIC? I went to college from 1966 to 1970 at Swarthmore College, which is right outside of Philadelphia. There were very active antiwar groups there. I came from Ohio. I was a really small town girl and really knew nothing about this. But by the time I graduated I had been involved in some protest and doing some draft counseling, and I wanted to continue doing work that was of use to the antiwar movement. Most of my friends in school went to graduate school. I didn’t want to do that. My husband was in law school at the time in Philadelphia, so we moved to Philly. I started asking around, and one of my friends who had been a draft counselor said there was a group at the American Friends Service Committee (AFSC) that was doing research on the war. I jumped at it, because research was my interest, and what I was good at. So I walked into the AFSC office and asked about this group called NARMIC, which had just been started. I talked to the folks there, and they explained what NARMIC was to me, because it wasn’t a well known entity. And I joined. I think this was about 1971. NARMIC was a very interesting and unusual group, even for the Quakers, who did a lot of things differently. AFSC was sort of the social action wing of the Quakers. They did everything from working with refugees to conscientious objectors, and did work all over the world, basically in favor of peace and human rights. I hadn’t really heard of them before, but as it turns out, they had been involved in the peace movement forever. I had fairly quickly seen there was a need for more information in the peace movement. There were many many groups working against the war, but they didn’t have a lot of data to back them up. So AFSC started this group. It was intended to be a collective, a group that would work together with no boss, and was paid basically subsistence wages – intended, I think, to bring in some young people into working on the war. They hired a number of Earlham graduates, which was a Quaker college in the midwest, and from a few from other places. I walked into that just as one of the original members had left, so I took her place. When I came in, there was a growing antiwar presence among the Quakers, which was not surprising – after all, they’re pacifists, and they’d been involved in this for a long time. But they were the first to recognize that there was some need for more information for all these groups that were springing up. So that was the history behind the beginning of NARMIC. Can you go into a more detail about what motivated NARMIC researchers? Why do you think research had an important role to play in the antiwar movement? The antiwar movement was based on general feelings that the United States shouldn’t be involved in Vietnam. But many activists who were against the war didn’t have a lot of experience. How do they do stop the war? How do they oppose the war besides marching on the Pentagon and White House? And a number of them started to look at what weapons were being used in Vietnam. Vietnam was probably the first war that Americans had been in that used non-conventional warfare. They weren’t using tanks and artillery – they were using a whole branch of weapons and designs for what the military called counterinsurgency. And antiwar activists wanted to get at: who designed these things, and why are we using them? In light of those questions, the idea of doing research took off. There were some groups that were actively involved in helping NARMIC. 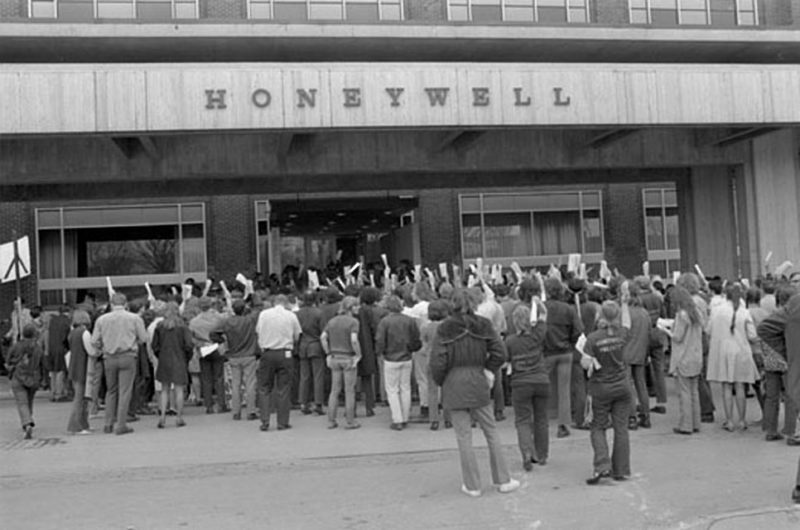 One was the Honeywell Project in Minneapolis. They had already figured out that Honeywell was one of the companies that manufactured napalm – napalm being one of the fairly new things being used in the war. They wanted to find out how it worked, why it was developed, who was making money off of it, and how it was being used in Vietnam. That was one of the earliest research parts of NARMIC. Very early on we focused on the companies, not only because there wasn’t much information out on them, but because those were the war profiteers from Vietnam. I think one of my first jobs working there was coming up with a new list of the top 100 defense contractors, what they manufactured, and where their plants were located – not just the headquarters, but the plants that were making these weapons. The top 100 companies that were making weapons of war for Vietnam – that got a huge audience, because it satisfied the need for this kind of information, for the targets like these and what we know about them. And obviously the companies weren’t going to tell this information, and almost all of this was classified. We had that information on the weapons because we subscribed to a monthly service called the DMS Market Intelligence Report. It was put out by the Pentagon for its military contractors. It had almost every military contract – the amount, the contractor, and a little bit of information about what it was for. It was perfect for us because we could analyze where weapons were being made, what they were, and who was manufacturing them. That was really the first piece of research that NARMIC got into. From there came the second piece of research, a report called “Weapons for Counterinsurgency.” This was a more complicated but more analytical report. It explained what all these weapons were — like cluster bombs, which were fairly new, and all the different kinds of weapons that were being used in Vietnam that weren’t part of the US arsenal before – and who made them, and whatever we could find about how they were being used. That report got a lot of publicity in the movement and was used to help people outside of Washington understand the Pentagon bureaucracy’s language and codes for what was really going on. So those two reports – the Top 100 Defense Contractors and Weapons for Counterinsurgency – were the first, and they were used by antiwar groups all over the country. What was the research process like? Would you all be researching this as a group? What was the process of putting it all together? We would divide things up. One of our members focused on the antipersonnel weapons – the cluster bombs, the various other kinds of aerial mines, and things that were being used in Vietnam that hadn’t been used before – various different kinds of rapid fire weapons. He would go through all the Pentagon reports about these – most of our sources were Pentagon sources. Our job was not only to find out what these things were, but to translate the words into plain English and explain what they did and where they came from. For example, BLU-63 was basically a cluster bomb. You wouldn’t know it from the way the Pentagon talked about it, because they had different kinds of acronyms for them. BLU was made of bomblets, the little bombs that were in the big cluster bombs. When the cluster bomb goes off, the pellets come out and can injure people. They’re these little tiny bomblets that the military can use to soak an area with fragments of tear gas or phosphorus. All this is pretty technical, so we had to devise ways to understand and translate the Pentagon’s explanations, because civilians had no idea what they were talking about. At that time the Pentagon was open to anybody – it wasn’t until the Weathermen set off a bomb later on in the 1970s that they closed everything to researchers. I remember going into the Pentagon library and looking up some of these weapons. Whatever was not totally classified was available if you knew where to look for it. But it took a lot of work to translate all of this. We gradually became pretty sophisticated in understanding what the Pentagon was doing. They were hiding most of this under acronyms and making classification systems. Researchers like us decided this was going to be our thesis, and we were going to figure out what the heck was going on. Meanwhile – and this is just another important piece – the AFSC sent staff to South Vietnam who were busy providing medical service to people who had been injured by bombs and other weapons, providing artificial limbs, providing medical help. We were getting reports from the staff in Vietnam about what the effects of these weapons were on people – the civilians, not the military – and combining that with the research on what was happening, why the Americans were using these particular weapons. So we ended up using research from the field as well, which was unheard of. Nobody else had staff in Vietnam, I think, besides the military. Can you talk a little bit more about the relationship between NARMIC and antiwar organizers on the ground? How did that relationship work? NARMIC had an advisory committee that met every three or four months. It was made up of people involved in various antiwar organizations, as well as scientific organizations, Clergy and Laymen Concerned About Vietnam (CALCAV), and others. Vietnam Veterans Against the War (VVAW) was part of it after they got started, as were a group of international scientists opposed to using science for military and war purposes. They’d come together and help advise us on what was needed, what they thought this might be useful. So we were fairly often in contact with the activist groups. They would also come through and actually do some research in our files as well – you know we didn’t have computers to look up these things. So we had voluminous files – files and files and files of articles that had appeared in various papers and other places, that we had filed under different subjects. So there was a lot of interaction between these groups. We all had friends in these groups, including the Philadelphia Resistance, which was the main antiwar group in Philadelphia. And while they were out protesting against recruiting stations down the street, we were helping them get information about GE, which had a plant in Philadelphia that was manufacturing pieces for the antipersonnel weapons. People were personally allowed and encouraged to come in and do their own research on companies and whatever they were interested in. We had a fairly continual influx of antiwar activists coming in, wanting to more know about, say, what Edgewood Arsenal was doing in Maryland. So we would help them do the research. We weren’t the only people doing this. We felt it was very important for the activists themselves to do some of the research to understand more basically how these things all connected. You mentioned that you did trainings. There’s a section of a 1970 NARMIC pamphlet that says you trained local organizers to do their own research. Can you talk about this? We would show them files we gathered – mainly from reading all the military magazines we could subscribe to, as well as the New York Times and some of the other more technical magazines. They could come in and research a company or a weapon using those sources. We also showed them how to look at congressional reports, things that were published in the Library of Congress archives, which very few people knew about or knew how to look for. We would get phone calls from some of these groups saying things like, “I need to know about this, we’re having a march tomorrow night,” or “what can you tell me about Boeing and its plant outside of Philadelphia?” We’d help them look it up and then tell them to go to the library and look up certain other things. So we would be the research arm, and we’d also teach them how to do the research, hoping we wouldn’t have to do it for everyone else. Can you talk a little bit about the slideshows you made? We found a little business in Philadelphia that would copy slides pretty quickly, and we decided to sell them as kits. That’s what people were asking for – it was all driven by the market, by the activists who were trying to find tools that they could use to educate their communities. “Automated Air War” became used all across the country. Groups would take the slideshows out into communities all over the country and show them. I remember talking to some of the veterans that were using the slideshows. They would go into the bars and set them up, and they’d get their fellow veterans to see it. They’d even go into VFW places and show these things before anybody had a clue what they were trying to do! It really hit a nerve. Organizers now had a tool they could use as a group. It wasn’t just an individual reading a pamphlet. It was a group activity, and that was the the important part of it, because it was self reinforcing. People would talk to their neighbors. If you’re just reading a pamphlet or a report, it’s a mostly individual act. So this, again, was part of the activism part of research. It wasn’t just research for research’s sake. It was research that would be useful to activists. And that was something new. 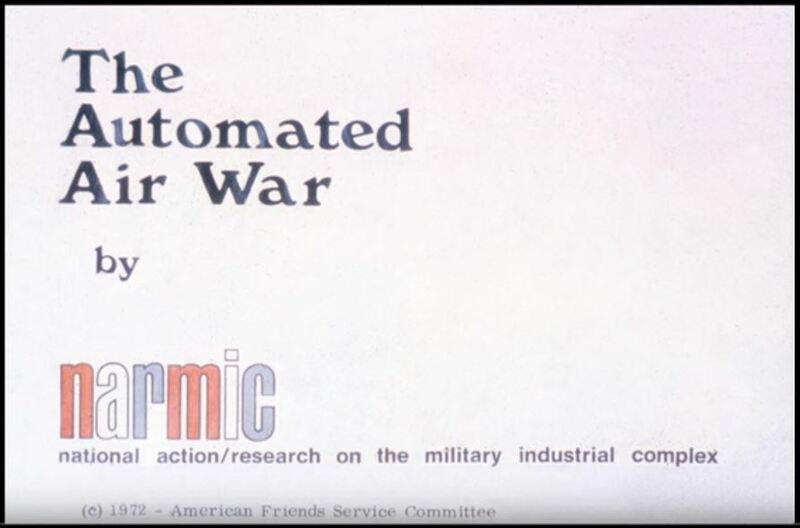 The Automated Air War, a slideshow put together by NARMIC. See it here. Looking back, where do you see NARMIC having had its biggest impact? In the early days, the slideshow was most effective at galvanizing local communities. I think it was shown to some congressional committees, but it was more designed as a community piece to get people involved and interested. I think that was the most important part of that research – reaching local people, not just activists. I remember going back home to Ohio after the slideshow came out. I told the people in Ohio – I lived in a very small village – that I’d like to show this slideshow, and the church said I could do that. So I showed the slideshow and got a pretty good response. People would come up to me and say: “What can I do? Where can I get more information?” There was no antiwar group in that community. The newspaper wrote a little editorial saying the slideshow was pretty good, even though it was antiwar – because the person showing it was one of their own. They linked it to local people who were respected in these communities, who were not outside agitators. So I think these tools played a big role in decentralizing the movement and making it much more attached to local communities. Where did NARMIC go after the Vietnam War wound down? The end of the war came slowly – and the end of the war really came when Congress cut off funding for the war. We worked with a group in Washington called the Indochina Research Group. We worked with them to put together a briefing book for Congress that looked at these projects. It showed what their real effects were and the effects that the real people that were profiting from these particular projects had. So it was a counter-report. We distributed it to Congress and the press. And it was only after we actually started to explain what these funds were used for that Congress had been voting for all this time, and making the case why they shouldn’t be used, why they shouldn’t be granted – that was the final nail in the coffin for the Vietnam War, when congress refused to authorize money. And I am proud to say we had a hand in that. The war ends. Then NARMIC branched into a few other areas. One was a report that we called “Police on the Homefront.” It was a collection of essays looked at how the weapons and equipment from the war were being brought home to be used by the police in counterinsurgency here. Again, we looked at the companies that had contracts for these weapons, what were they using, and what cities had these contracts to use weapons for surveillance training and counterinsurgency. And we got a whole list, that not only explained what was happening, but how this was getting past Congress – because they had different names for these things. They were the same weapons, same ordinances, but they ended with different kinds of names. They were camouflaged. We looked at various places, including campuses that were using this kind of training to basically control Americans on the homefront. There was an organization at the federal level called the LEAA – the Law Enforcement Assistance Agency. It was actually delivering tanks and various other weapons to cities – and even campuses – that wanted that kind of help. So this was another piece of counterinsurgency research that we did for a while. Shortly after the war ended, we had an advisory board meeting and talked about what to do now that the war was over. Some of the scientists on it said they needed us to start looking into nuclear weapons because the military was developing all these new kinds of nuclear weapons under Reagan. They were funding them and nobody knew what they were. So we started looking at contracts, trying to see what was going, and again put out some pamphlets. The cruise missile was brand new, and there were lots of other pieces of artillery and other military weaponry that had been adapted for nuclear weapons, including trident submarines. It took a long time to figure out what all these things were. Reagan had really ramped things up by this time – the early 1980s – and from reading some of the military magazines and from looking at the contracts to companies we gradually put together not only the lists of the nuclear weapons being developed but what they did, how they were to be used, and how they fit into the philosophy of fighting a new nuclear war in the late 20th century or in the early 21st century. Nobody had done this before, not even the scientists. So again we started putting out pamphlets. We worked with some of the groups in Europe to come up with some easily understandable descriptions of what these new nuclear armaments in this new arms race were, what they were designed to do, and who was getting the money to design them. All this, again, went back into the hands of antiwar organizers who were turning to different subjects after the war. Some of them were working on local issues, like police issues, and some of them ended up working on the antinuclear movement, including the Berrigans. We worked with them again to get them information so they would know which military bases to go into and which weapons to pour blood on – so that they knew what they were doing instead of just being antiwar. That wasn’t as popular a movement as the Vietnam antiwar movement, but it was a pretty strong movement that lead to some of the largest protests, around nuclear freeze activities, in the history of the country. We did a lot of the research they used. The Pentagon was not happy with this. We had some moles coming into NARMIC and trying to figure out what we were doing, but we could usually spot them pretty easily and neutralize them. They had us in their sights. Once, the FBI office in Media, Pennsylvania was raided, and the draft files and long FBI files were stolen. That produced a whole host of publications about how the FBI was trying to subvert and directly hinder movement groups. We weren’t the people doing that, but we helped them with interpreting some of the documents to see what all this gobbledygook really meant – to help them understand the role of the FBI in suppressing dissent. Because we were the ones doing the research and looking up the background of some of these things, we could help put it into political context, as well as translate all the acronyms. NARMIC’s top 100 defense contractors list, which continued after the war. Here is a 1977 edition. Why did NARMIC eventually come to an end? Well, a couple reasons. The AFSC was having some fundraising issues. They were having shortfalls in some of their fundraising at that point. That was part of it. But also I think it didn’t have the strong focus because, again, the antiwar groups and the peace groups had by then gone out in so many different areas that it was much more diluted and divided. So, I think that basically there wasn’t the need – or there wasn’t the feeling that that there was the need – for all of this research that was centralized in Philadelphia. The AFSC also changed hands and changed management, for all kinds of reason that I don’t really know because I wasn’t there. NARMIC wasn’t laid down until the late 1980s, I think. But it had generally been weakened in its effect because it had fewer people, and they were pretty diluted in the effect they had because they were working on so many different kinds of issues at a time. Most of the original NARMIC staff had left by then, so it was a new group, and they probably had some different priorities. I knew who they were but I couldn’t tell you exactly how they were working at that point. It sounds like one of the emphases that drove your research was to try to understand the corporate power behind militarism. Why do you think it’s important to understand that? Why do you think it’s important for organizers to understand the role of corporate power in what we’re up against? Militarism doesn’t happen in a vacuum. It doesn’t just grow on its own. There are reasons why militarism grows and thrives in a society, and it’s because of the power relationships and who’s profiting and who’s benefiting from the militarism and from the pieces that make up that militarism. So it’s important to not only know what it is – what is this militarism, what are the components, what’s really happening here – but also who’s behind it, and what is its pushing force? Is it profit? A new kind of philosophy? Both? It’s really important to go behind the scene. And it’s all pretty hidden, especially in this day with the Pentagon and all of its classified work. Getting behind and underneath that veneer of the military is crucial to understanding what’s really going on. And I think we understood that. And by putting out our resources, I think people gradually became aware of the fact that it wasn’t just that the United States wanted to develop napalm because they could. There was also profit in it. Companies like Honeywell was making millions off of it. All of that was hidden. So you can’t really look at militarism, or a even a particular war or something like a nuclear arms race, without really understanding: what are the propellants behind it? And it’s usually pretty well hidden. The military contractors have a language all their own, and it takes a while to figure out what is really going on here. When you look back on your experiences and when you look back on the arc of history since then, since the Vietnam War, how do you think about NARMIC’s legacy and its place in history? I think NARMIC played a real role in educating the American public about the Vietnam War – as much as the Vietnam veterans did, in a different way. And those two forces – both the corporate research, and the veterans coming back – were the significant power behind the ending of the wars. I’m pretty sure of that. So I think it did play a pretty big role – not the only role, by any means – in building a movement that was informed and activated on the basis of facts, not just feelings. And I think that the whole concept of action research is still around. I think that the model is now there, whereas before there wasn’t much to go on. I don’t know of anything that was really done in previous wars, for instance. There were antiwar movements, but they were mostly conscientious objectors and people that had a faith-based or philosophy-based reason to oppose the war – not so much based on what the war was and what it was attempting to do.